When I first came up with my #50for50 list, Morocco was right at the top, just after skydiving (location still TBD). A friend went to Morocco a few years back, and after seeing her pictures camping in the desert, I knew I was on my way. My cousin Didi and college friend Kim raised their hands to join me, and we joined an Intrepid Travel tour group that whirled us across Morocco in 13 days from Casablanca to Marrakesh. We all fell in love with the country and our charming tour guide Hamid, who was lucky enough to end up with 12 highly independent, spirited women — 11 of us single! Best yet, his harem represented four countries and four decades — a dozen 25- to 65-year-old Germans, Australians, Canadians, and Americans. Within a few short days we turned our mini bus into a party bus, singing and dancing as the kilometers flew by. The blue dawn hues of Chefchaouen (#14 on my list) enchanted us, while Fez (#15) made Didi and me want to get lost in the narrow winding streets of the old medina. 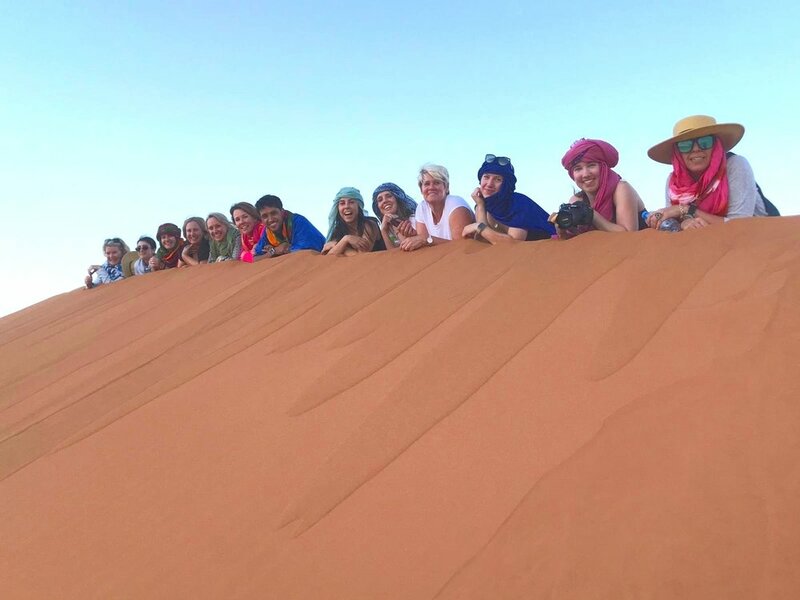 The absolute highlight though was our camel ride to a desert camp in the Erg Chebbi sand dunes (#13) outside of Merzouga. We had picture-perfect weather and little wind, which let us climb a dune at sunset and sleep under the stars, nodding off to the sound of local drummers and singers in the distance. We continued on to the Atlas mountains and then along the Road of 1,000 Kasbahs to Marrakech (#12), which was a perfect shopping-frenzied ending to the magical trip. Thank you Hamid and the Giirls. What an incredible journey we shared together! The myth of "no pain, no gain"